College life is hard – classes, exams, term papers, and parties fill the average day in a student’s life. Keeping a dorm room clean may not be a top priority for most as they’re spending time exploring the wild world of college parties and 100-page nightly reading assignments. Or maybe they just aren’t yet used to cleaning up after themselves. Whatever the case, we wanted to get the scoop on dorm germs. So we used an EMLab P&K test kit to examine the bacteria found in students’ rooms. 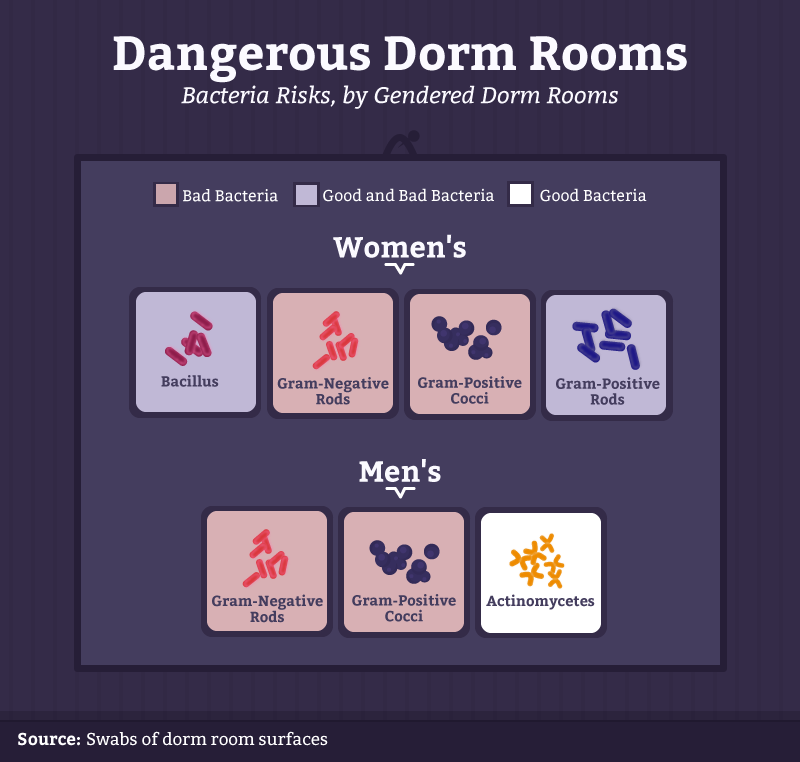 We looked at eight different surfaces in both men’s and women’s dorm rooms, comparing how many as well as the kinds of bacteria we found. Feeling clean now? Read on to see the dirtiest places we discovered in an average dorm room. Bacteria, when quantified, is measured in colony-forming units (CFU). 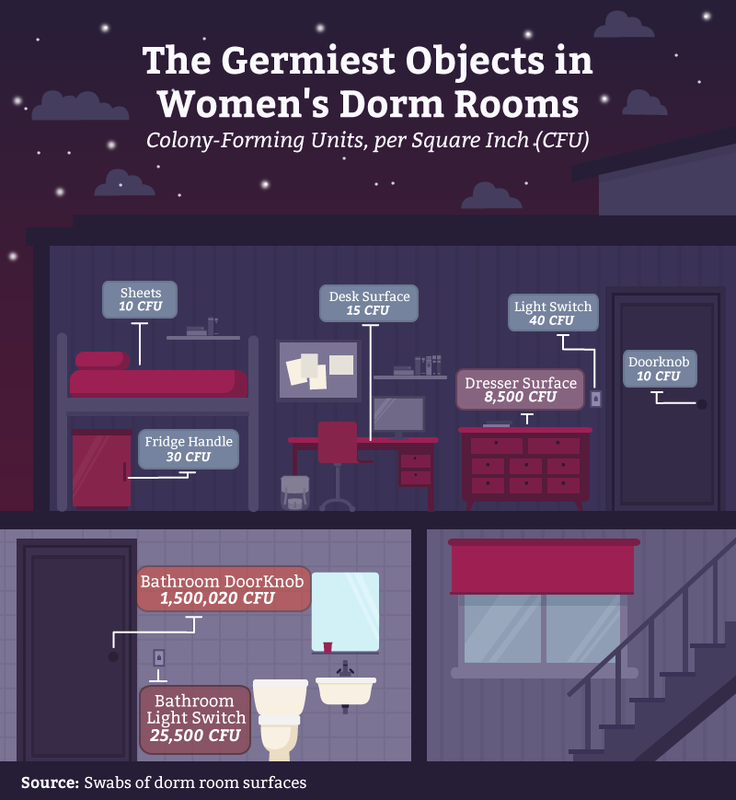 Based on the dorm rooms that we studied, the average women’s dorm rooms had over 1.5 million CFU/sq. in. of bacteria. 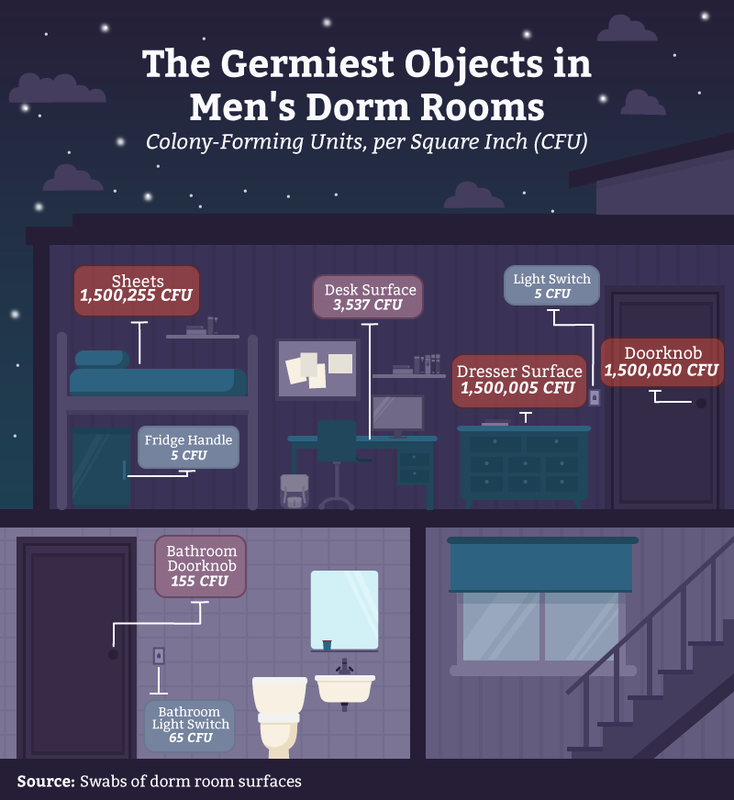 While that may seem pretty icky, men’s dorm rooms had an average of over 6 million CFU/sq. in. Studies have shown that kids build their immune systems over time and that being exposed to dirt and grime can be healthy for them – to a certain extent. Of course, that argument typically applies a younger age group than college students. The doorknobs, dresser surfaces, and (surprise) bed sheets in the men’s dorm rooms we swabbed all had over 1.5 million CFU/sq. in. of bacteria on average. For comparison, a pet’s food bowl (typically one of the germiest items in a home) has an average of just over 2,100 CFU/sq. in., while the standard house rug has roughly 200,000 CFU/sq. in. Other dirty spots in the men’s dorm rooms included desk surfaces with just over 3,500 CFU/sq. in. (far more than a dirty kitchen sponge) and bathroom doorknobs with 155 CFU/sq. in. Research goes back and forth on whether it’s men or women who are ultimately the dirtiest. 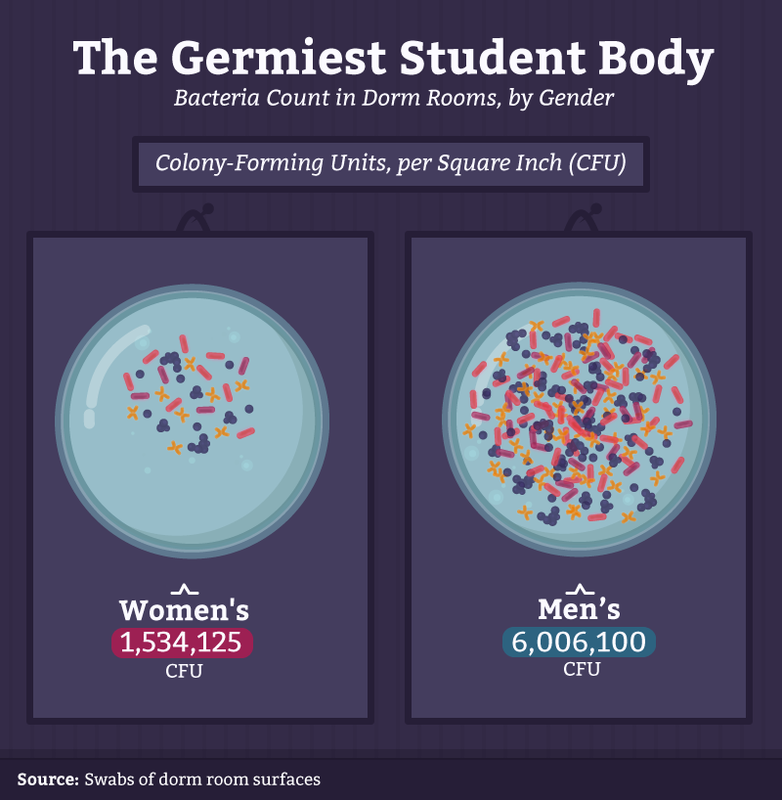 While we can’t weigh in on this gender debate as a whole, our study of college dorm rooms found far fewer bacteria in women’s dorm rooms, particularly on their sheets and doorknobs, which only had 10 CFU/sq. in. each (compared to 1.5 million CFU/sq. in. on men’s doorknobs). Women weren’t entirely bacteria-free, though. Their bathroom doorknobs were, on average, just as dirty as men’s dorm room sheets, and their bathroom light switches had over 25,000 CFU/sq. in. – that’s almost as dirty as a used dollar bill. Bacteria-laden bathrooms in the women’s dorm rooms could be attributed to things like old, out-of-date cosmetics, which can harbor dangerous strains of bacteria. Unfortunately, cosmetics in the U.S. are not required to list expiration dates, and it can be difficult to remember when an item was originally purchased, increasing the likelihood of lurking bacteria on old mascara wands and lip gloss containers. In fact, some studies suggest that up to 89 percent of women admit to holding onto old makeup in case they might want to reach for it in the future. 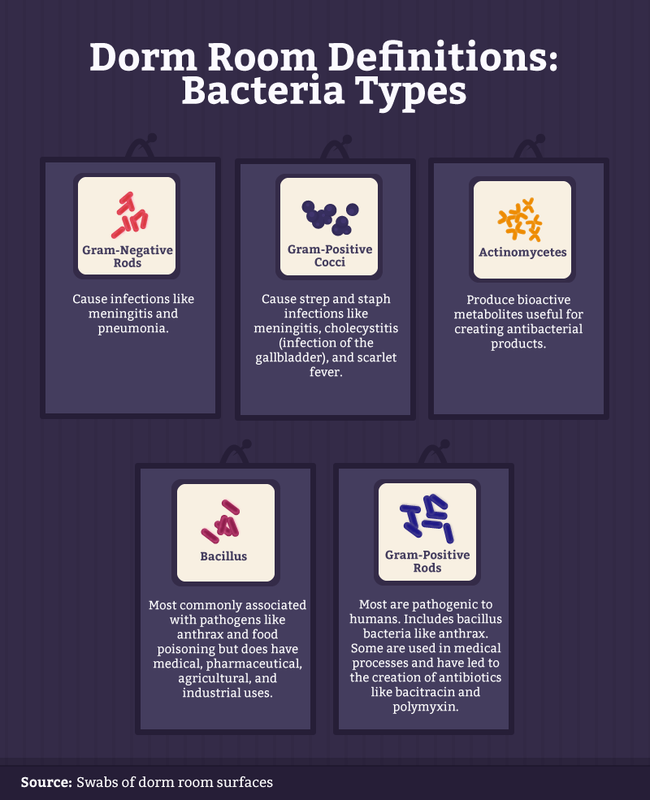 Not all bacteria are created equal. The samples we studied included various microbes that can affect one’s immune system in different ways. For example, if you encounter gram-negative rods, you could later get sick as a result; whereas actinomycetes may indicate dirty surfaces, but those surfaces may not be harmful to humans. Do certain bacteria prefer men’s or women’s dorm rooms? Check out the breakdown below. The only thing happening between the sheets in the men’s dorm room is CFU/sq. in. There were over 150,000 times more bacteria found on men’s sheets than on women’s. Whether that’s due to the frequency of a thorough cleaning (or lack thereof), perhaps a great gift for those male college students in your life would be a roll of quarters for the washing machine, a bottle of detergent, and maybe even some new sheets. Women weren’t exactly squeaky clean either – their bathroom doorknobs had almost 10,000 times more bacteria than men’s. 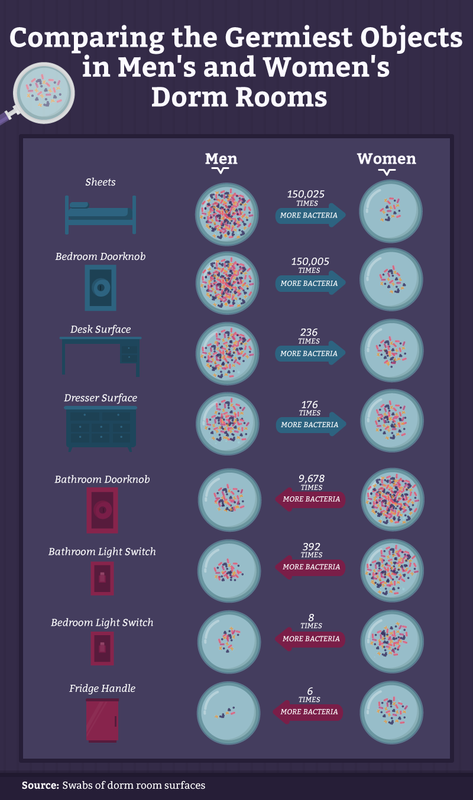 Their bathroom light switches (almost 400 times more bacteria) also shine a light on female bathroom habits. Women, on average, are more likely to spend over an hour in the bathroom than men and could spend up to three or more years of their life in their bathroom. It might not hurt to gift them soap and disinfectant as well. Bacteria are grouped into two main categories, gram-negative (those without cell walls) and gram positive (those with cell walls). While their names mair carry a certain connotation about their effect on one’s health, both strains have the potential to cause infectious diseases. Harmful bacteria, like gram-negative rods and gram-positive cocci, showed up in both men’s and women’s dorm rooms. Women’s dorms also had strains of bacillus, which can have some pretty nasty side effects (like respiratory infections) when ingested. However, despite their dirty reputation, not all bacteria are bad. Women’s dorm rooms also showed a prevalence of gram-positive rods, including some helpful strains of probiotic bacteria, which live peacefully inside us and aid in digestion. Men’s dorm rooms even had occurrences of actinomycetes, where certain strains act as important pathogens that are beneficial sources of antibiotics. While some of the bacteria we found were neither good nor bad, the bulk is potentially hazardous, so good bacteria are no excuse not to clean knobs, desks, and other surfaces occasionally. 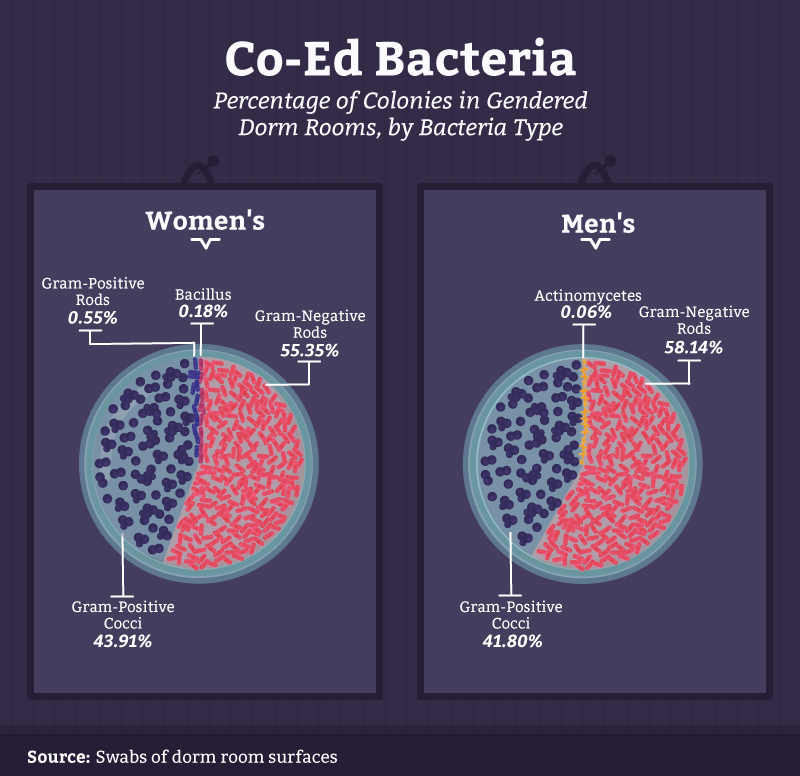 For both men’s and women’s dorm rooms, gram-negative rods accounted for over half of all bacteria we discovered. These are generally harmful and can lead to some pretty gross side effects when contracted. Despite the seemingly helpful name, gram-positive cocci also totaled more than 40 percent of all bacteria found in both sets of dorm rooms. Together, over 90 percent of the bacteria we found are potentially harmful to college students. Small percentages of gram-positive rods, actinomycetes, and bacillus were also found, and while potentially helpful, these strains accounted for less than 1 percent of all the bacteria we swabbed. Which parts of male and women’s dorm rooms were the dirtiest? Despite being a place people use to get clean, our research concluded that women’s bathrooms contained over 65 percent of the bacteria colonies found. Even though we may hope our bathrooms are squeaky clean, bacteria can lurk in some unsuspecting places. Doorknobs, toothbrush holders, and light switches can be havens for grungy germs. For men, over 97 percent of their bacteria was found in the sleeping quarters of their dorm rooms rather than their bathrooms. Maybe they don’t spend as much time getting ready in the bathroom, or the stuff they keep in their dorms is just gross. Either way, a nice deep cleaning is definitely in order. Overall, we found a lot of bacteria across both sets of dorm rooms. While women had their fair share of dirty surfaces (mostly in the bathroom), men’s rooms had almost nine times as many CFU/sq. in. across the surfaces we inspected. While not all dorm rooms are total disasters, we found bacteria lurking in some surprising places, like dressers and bathrooms, and some not so surprising places – like guys’ bed sheets. Unfortunately for these students, nearly all the bacteria we discovered can be harmful in some capacity. For more cutting-edge college data, visit CollegeStats.org. We can help you prepare for your future by providing the best research and information so that you can pick the best school. From your freshman year to grad school, CollegeStats.org is your go-to resource for all things college. Visit us online today to learn more. EMLab P&K performed all laboratory testing. The numbers presented are an average of all like samples taken. We swabbed 24 surfaces in four different suite style dorm rooms and eight surfaces in suite style shared bathrooms in southern Florida. Two rooms were occupied by male students, and two were occupied by female students. The surfaces swabbed in each room were the bed sheets, desk surface, dresser surface, light switch, doorknob, mini fridge handle, bathroom light switch, and bathroom doorknob.